Archaeologists in Mexico have uncovered 25 “alien”-looking human skulls with in a cemetery in the northwest state of Sonora, they said today. Some of the skulls showed “deformities,” said Cristina Garcia Moreno, who worked on the excavation project with Arizona State University, which analyzed the bones. The bones are about 1,000 years old, dating from 945 A.D. to 1308 A.D. If you’ve ever spent any time browsing a UFO forum or website, you’ll eventually run into a link or claim that the ancient Mesoamericans and Inca were either aliens» or worshiped aliens as gods. The “proof” is usually a skull much like the one you see depicted here. And it does look alien! Indeed, this must have completely baffled the first Westerner to uncover such a find! The recent issue of Archaeology has a sidebar that briefly describes the practice of modifying the shape of the human skull by the Maya. 90 percent of the skulls recovered at Maya sites show evidence of being artificially shaped. Mothers began deforming their children’s skulls shortly after birth by applying devices such as splints, cradleboards, or tightly wound cloth. The practice of head hspaing was a regular part of pre-Hispanic life and was required for a child’s integration into society, which often took the form of hetz mek, or naming celebrations. Alien Skulls? Not even close! I can't believe just how gullible people in the news media have become and someone posts that malarky in the Science forum? Last edited by plwhit; 12-24-2012 at 06:43 PM.. So they're not crystal? Darn. As you might have suspected nothing you just heard is true, the real story about the Mitchel Hedges Skull (MHS) is quite different. It’s worth mentioning that the reason that Ancient Aliens focuses in on the MHS is because all of the other known crystal skulls have now been proven to be fakes  and even ancient aliens admits this. If aliens really were visiting Earth, don't you think they'd have the technology to fully cloak themselves? We would never know they existed. People have short attention spans. 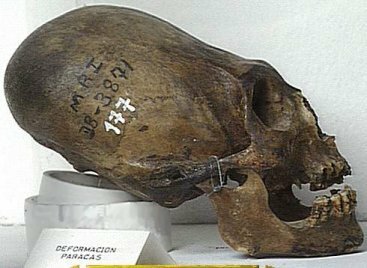 Nobody would read it if it was titled "Evidence of Ancient Tribal Artificial Cranial Deformation Found... Again" .